The WMSAW30 series of AC DC wall mount power supplies provides up to 24 watts of output power in a compact 2.80” x 1.70” x 1.08” package. This series consists of single output models with a wide input voltage range of 90~264VAC and multiple output voltages available. 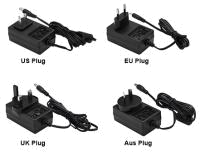 Four different plugs are available: US plug, UK plug, EU plug, Aus plug. All models are RoHS Compliant and levels over 5 volts are Energy Efficiency Level VI compliant. Models are also protected against over current and short circuit conditions, and have been drop in and burn-in tested. Please call factory for ordering details. Dimensions: 2.80" x 1.70" x 1.14"
Notes: (1) “x” in model name refers to plug type option. 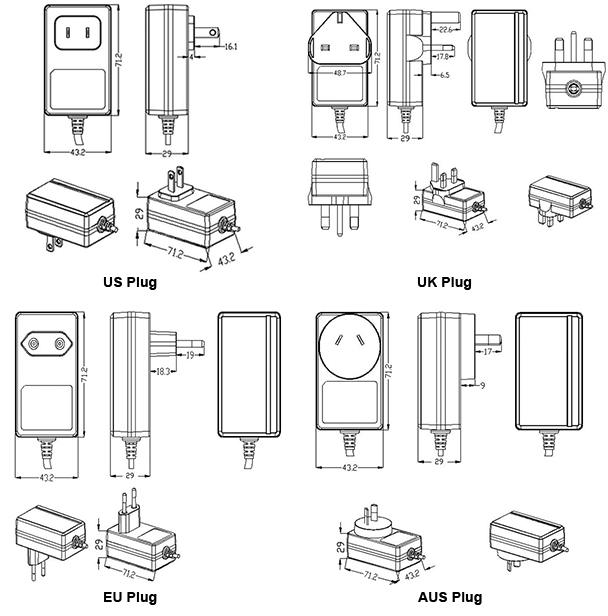 “x” can either be “U” for U type =US plug, “B” for B type =UK plug, “G” for G type =EU plug, or “A” for A type= Aus plug.